Originally published March 23, 2014 at 10:45 p.m., updated March 24, 2014 at 7:16 a.m.
Felipe Chavez-Ramirez has scars on the back of his hands and forearms from catching whooping cranes. Part of a team of researchers from multiple organizations putting lightweight GPS devices on whoopers, he’s the guy who first puts hands on the 5-foot-tall birds. The research team put tracking devices on 68 of the endangered birds of the Aransas-Wood Buffalo population during the span of four years. That was more than 20 percent of population, said Wade Harrell, whooping crane recovery coordinator for the U.S. Fish and Wildlife Service. The GPS units, which are attached to the bird’s upper leg, send the location of the bird to a satellite four to five times a day, according to a U.S. Fish and Wildlife Service press release. To learn more about the Aransas-Wood Buffalo Whooping crane population, the Whooping Crane Tracking Partnership began banding and tracking the Aransas-Wood Buffalo Whooping Crane population in 2009. The purpose for this project is to document their locations, monitor survival and their stop over locations. Since the study began, many key areas have been identified where the Whooping cranes stop over during migration. We did not know about many of these places until this study. Now that habitat around Aransas NWR and along the flyway corridor is under development pressures, hopefully some of these key stop over areas can be purchased, conserved, and protected to ensure that there will always be habitat available for the wild ones as they migrate along the flyway corridor. The following report gives a more in depth explanation of the whooping crane tracking study project and its objectives. The Whooping Crane Tracking Partnership began in 2008 as a research project to use Platform Transmitting Terminals with Global Positioning System capabilities (GPS-PTTs) as a means to advance knowledge of whooping crane breeding, wintering, and migratory ecology including threats to survival and population persistence and to provide reliable scientific knowledge for conservation, management, and recovery of whooping cranes. The Partnership is comprised of the Canadian Wildlife Service, Crane Trust, Platte River Recovery Implementation Program, U.S. Fish and Wildlife Service, and U.S. Geological Survey, with support from the Gulf Coast Bird Observatory, International Crane Foundation, and Parks Canada. Partners agree the opportunity to mark wild whooping cranes with GPS technology will greatly enhance our knowledge of whooping cranes and enable us to assess risks they face during their entire life cycle. To date we have captured and attached GPS-PTTs to 31 juvenile whooping cranes at breeding sites in Wood Buffalo National Park and 24 adult and 2 juvenile whooping cranes at wintering sites at Aransas National Wildlife Refuge. Capture teams consist of individuals with experience handling endangered cranes, including a licensed veterinarian. the volume of rich information provided by marked individuals. access landowners have provided us during the past several migration seasons. Upon completion of the research projects, the Platte River Recovery Implementation Program plans to use information obtained via telemetry and at stopover sites to create and manage similar habitats along the central Platte River in Nebraska. Whooping cranes are the symbol of conservation in North America. Due to excellent cooperation between the United States and Canada, this endangered species is slowly recovering from the brink of extinction. There are several ongoing efforts by government and private organizations to protect and manage whooping cranes. The U.S. Fish and Wildlife Service and the Canadian Wildlife Service are the primary governmental agencies responsible as caretakers of the Aransas-Wood Buffalo National Park population (AWBP). These cranes nest in northern Canada’s Wood Buffalo National Park and winter on the Aransas National Wildlife Refuge in Texas. It is the only remaining wild, self-sustaining migratory population of whooping cranes in the world. Friends of the Wild Whoopers (FOTWW) is one of the private groups whose mission is to assist the agencies in their role. Educating and keeping people informed about the only remaining wild, self-sustaining migratory population of whooping cranes in the world and management options to protect and increase the population. Later on, in a year or so, after increasing interest in FOTWW we will consider becoming a formal organization. During future months, make an effort to interest more people about FOTWW with emphasis on people along the Aransas-Wood Buffalo Population (AWBP) flyway, including Canada. Whooping cranes are the tallest birds in North America standing at a height of approximately 5 feet. They have a 7 ½ foot wingspan measured from tip to tip. Whooping crane showing black tips of primary feathers. They weigh only about 15 pounds even though they appear larger. Whooping cranes are almost entirely white. The body and wing feathers are a bright white, except on the tips of the outer wings. The tips of the primary feathers are black and can be observed only when their wings are outstretched as during flight. A large red patch on the head is an obvious characteristic of the whooping crane. The red patch extends from the cheek, along the bill and over the top of the head. The red patch is made of skin and is almost featherless. Their eyes are yellow and their long legs are black. While in flight, their long necks are kept straight and their long dark legs trail behind. Whoopers are graceful flyers and picturesque dancers. The baby chicks, known as colts, have a soft buff brown covering. When the chicks are about 40-days-of-age, cinnamon-brown feathers emerge. When they are one-year-old white adult plumage replaces the cinnamon-brown feathers. Whooping cranes live about 20-25 years in the wild. Their preferred habitats are wetlands, marshes, mudflats, wet prairies and fields. They are omnivores and primarily eat crustaceans, small fish, amphibians, reptiles and insects. They also consume grains, marsh plants and acorns. During the 1800s, whooping cranes were more abundant. Nesting was more widespread with records of nest in Iowa, Illinois, Minnesota, the Dakotas and northward through the prairie provinces of Canada, Alberta, and the Northwest Territory. 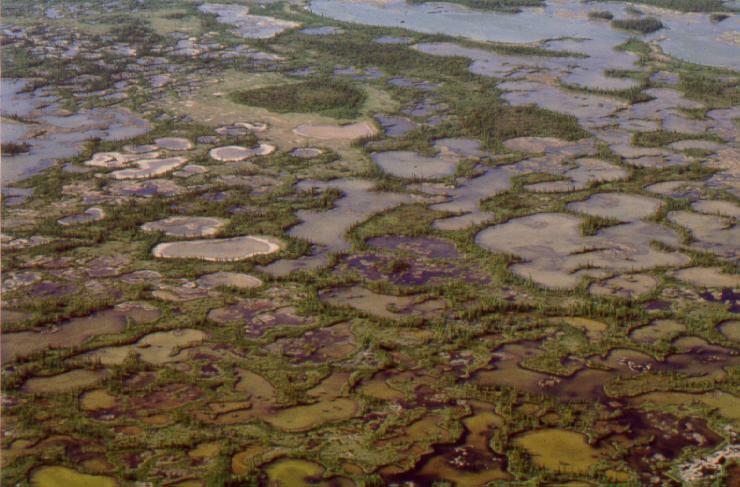 Wetland drainage and clearing of areas for farming destroyed whooper habitat and hunting reduced their numbers. The only wild population that survived by the 1940s was the isolated one nesting in Canada’s Northwest Territory. This population struggled but, with improved protection and public education the slow increase of birds has continued. The AWBP population increased from 16 individuals in 1941 to approximately 300 wild birds in September 2013. It is the only whooping crane population that maintains its numbers by rearing chicks in the wild. 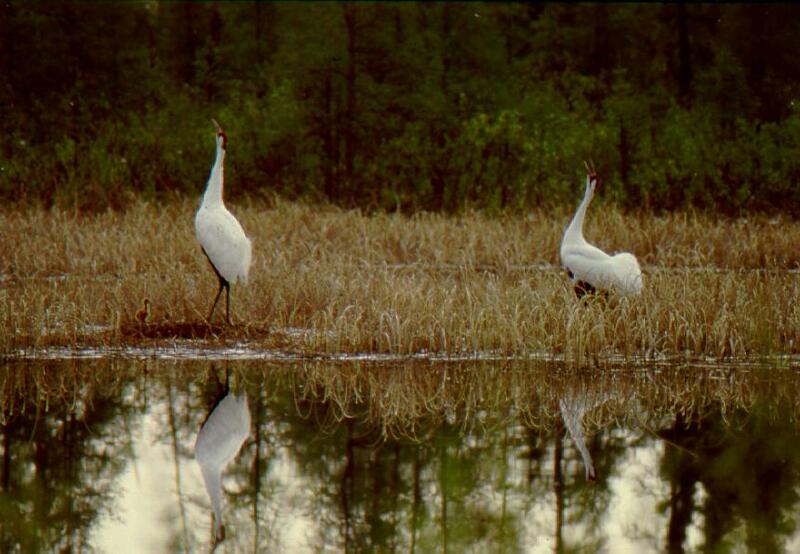 Efforts to increase the whooping crane population are ongoing in an experimental Eastern Population which migrates between Wisconsin and Florida. The Whooping Crane Eastern Partnership rears birds in captivity and releases them into the wild. Approximately 108 birds that they reared in captivity and released into the wild survive currently in this population. In addition, two experimental non-migratory flocks have been initiated in Florida (20 birds in 2014) and Louisiana (33 birds in 2014). An additional 162 whooping cranes are held in captivity to provide eggs to further increase the three experimental flocks and for research purposes. 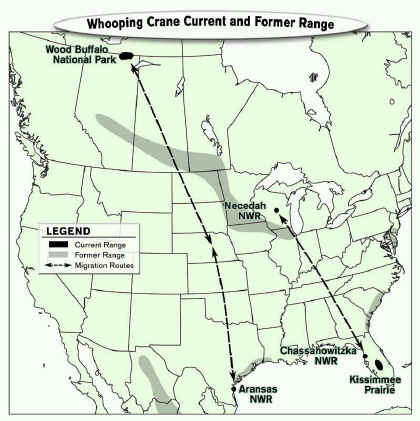 Whooping crane current and-former range and migration routes. Although there has been progress in increasing the numbers of whoopers, only one population maintains its numbers by rearing chicks in the wild. This flock now contains an estimated 300 birds that nest in Wood Buffalo National Park, in the Northwest Territory of Canada. After rearing their chicks, they migrate to Aransas National Wildlife Refuge on the Gulf Coast of Texas and bordering private land where they spend the winter. It is on this wintering ground where they are especially vulnerable. A chemical or oil spill could damage or destroy their food supply. Or a hurricane could destroy their habitat and kill birds. And a growing, equally dangerous problem is diversion of river waters that flow into the crane’s habitat. Competition is severe for the fresh water which is being used upstream for agriculture, business and for human uses in cities. Litigation is in progress to hopefully settle this problem. 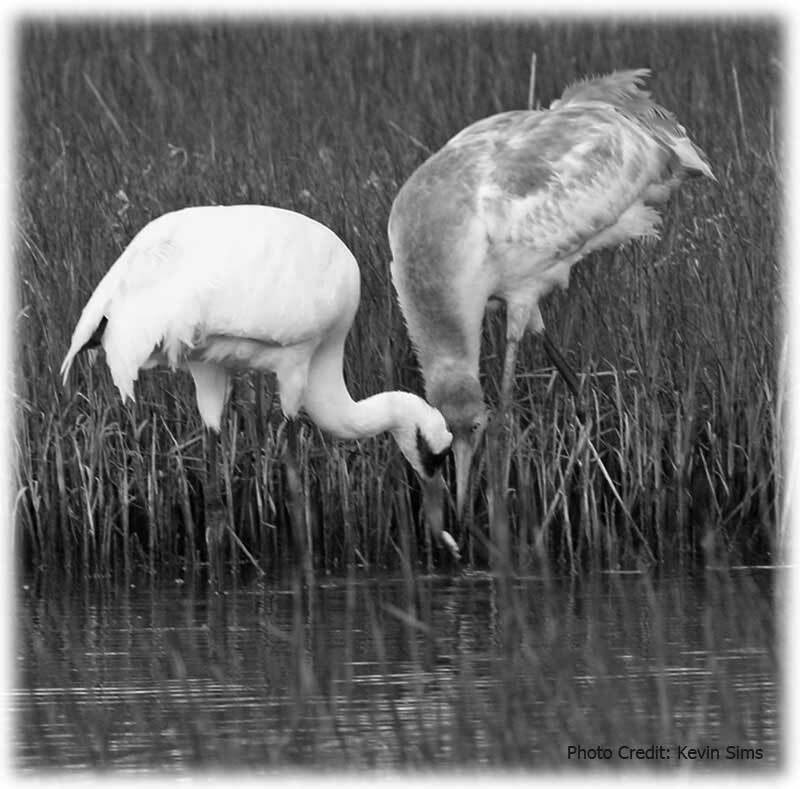 The steadily diminishing flow of fresh water into the bays and estuaries is making the area less productive for whooping crane foods. These foods are essential to keep the birds healthy for their 2,500-mile migration back to Canada where winter is just ending. And once there the nesting pairs need reserve energy for producing more young. During March and April the cranes migrate from Texas back across the Great Plains and Saskatchewan to reach their nesting area in Wood Buffalo National Park. Whoopers begin pairing when 2 to 3 years of age. Their interesting courtship involves dancing together and a duet called the “unison call”. Once pairs are bonded, whooping cranes mate for life. Females begin producing eggs at age 4 and generally produce two eggs each year. Typically only one chick survives but survival of both chicks is not unusual. Whooper pairs return to the same location (“territory”) each spring. If trespasser whoopers are in their nesting area territory, they are chased away. Nesting territories may include a square mile or larger area. Chasing other cranes away ensures there will be enough food for them and their chicks. During night whoopers stand in shallow water where they are more secure from danger. When the whooper pair settles in, they build a nest in a shallow wetland, often on a shallow-water island. Their large nest typically measures about 4 feet across and 8 to 18 inches high. It is assembled from plants that grow in the water (sedges, bulrush, and cattail). The two eggs are laid one to two days apart so one chick emerges before the other. Parents take turns keeping the eggs warm and they hatch in about 30 days. Chicks are called “colts” because they have long legs and appear to gallop when they run. Young colts can walk and swim short distances within a few hours after hatching and may leave the nest when a day old. They grow fast so they will be strong for the imminent migration back south. In summer, whooping cranes eat crayfish, minnows, frogs, insects, plant tubers, snails, mice, voles, and other baby birds. Colts become good fliers by the time they are 80 days of age. During September through November the adult whoopers lead their young and retrace their migration pathway to escape harsh winters and reach the warm Texas coast. As they migrate they stop occasionally to rest and feed on agricultural and weed seeds that fell to the ground as farmers harvested their fields. 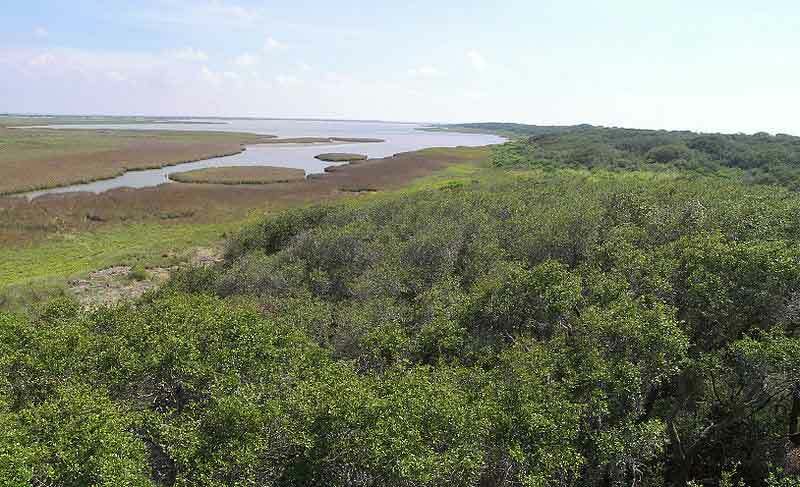 When they reach the Texas coast they live in shallow marshes, bays, and tidal flats. Pairs and their young return to the same area each winter. As they did on their nesting territory, they defend their winter territory by chasing away other cranes. Winter territories normally encompass 200 to 300 acres. Winter foods are predominantly blue crabs and soft-shelled clams but include shrimp, eels, snakes, cranberries, minnows, crayfish, acorns, and roots. 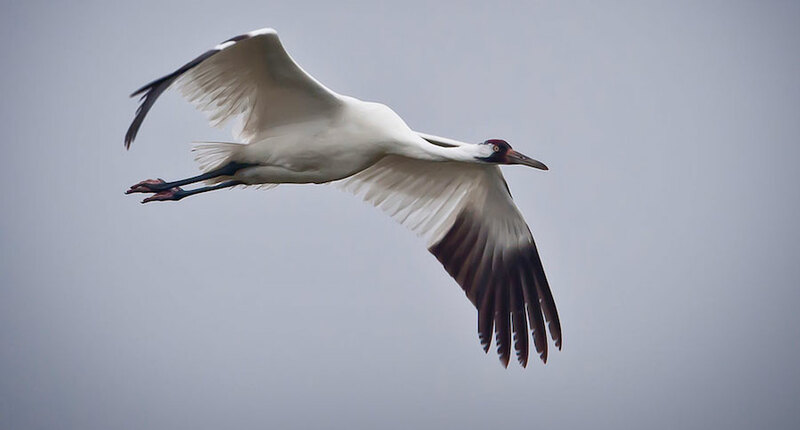 Individual whooping cranes may live as long as 25 years. However, they face many dangers in the wild. And while they can defend themselves and their young from many enemies, they must continuously stay on guard. Bobcats, coyotes, wolves, and golden eagles kill adult cranes. Crows, ravens and bears eat eggs and mink eat crane chicks. As they migrate, especially during storms or poor light, they occasionally crash into power lines and kill or injure themselves. In addition, they die of several types of diseases similar to all creatures. Below is a link to a recording of Whooping Cranes at Aransas National Wildlife Refuge, recorded January 26, 1954. The Macaulay Library has twelve different Whooping Crane recordings but this one is by far the best out of the twelve. It talks about 1954 being the first year that they had three young colts successfully migrate with their parents from Wood Buffalo National Park in Canada. The Whooping Crane population at ANWR for that winter was a total of 24, including the three colts. The first speaker you hear in the recording is Arthur Allen, a renowned ornithologist,for whom the Arthur A. Allen Award is named after. Julian Howard, the second person to speak and mentions the annual count being 24, was the manager of ANWR at the time. Six months later, the nesting grounds were found at Wood Buffalo National Park and no longer unknown. Very slowly during the past 60 years the flock has increased to approximately 300 in 2013. That’s progress by any measure.